The Nineteenth Judicial District Commission on Judicial Performance unanimously recommends that District Court Judge Thomas J. Quammen BE RETAINED by a vote of 10-0. Judge Quammen was appointed to the District Court bench in July of 2008. Prior to his appointment to the bench, Judge Quammen served as the Administrative Chief Deputy District Court Attorney for the Seventeenth Judicial District (Adams and Broomfield Counties), for three years, and the Nineteenth Judicial District (Weld County), District Attorney’s office for 22 years, the last 16 years of which, he was the Assistant District Attorney. In 1997, he was named Colorado Prosecutor of the Year by the Colorado District Attorney’s Counsel. He served several years on the Colorado Supreme Court’s Criminal Rules Committee. 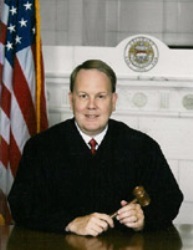 Judge Quammen received his law degree from the University of Missouri in Kansas City and his undergraduate degree from the University of Northern Colorado in Greeley, Colorado. He also holds a Master’s degree from the University of Colorado in Boulder, Colorado. The judge presides over 90% Criminal/Extraditions/County Court Appeals/Wiretap Reviews/ Warrant Reviews, and 10% Juvenile/Juvenile Magistrate Reviews. Judge Quammen has been active in the community by serving on such boards as the Weld County Community Corrections Board, the Weld County Pre-Trial Services Board, and the Community Justice Advisory Board. The Commission conducted a personal interview with Judge Quammen, reviewed opinions he authored, observed him in court, and reviewed surveys sent to attorneys and non-attorneys. Among the survey questions was “how strongly do you recommend that Judge Thomas Quammen be retained in office, or not be retained in office?” Of non-attorneys completing the survey, 87% recommended to retain, 8% not to retain, and 4% made no recommendation. Of attorneys completing surveys, 72% recommended to retain, 22% not to retain, and 6% made no recommendation. (Percentages may not total 100% due to rounding). Judge Quammen currently presides over a mostly criminal docket. Based on survey results of the non-attorneys, Judge Quammen received an overall combined average rating which exceeded the average combined rating of all district judges standing for retention. Based on survey results of attorneys, Judge Quammen received an overall combined average rating that was above the average combined rating of all district judges standing for retention. Members of the Commission were impressed with Judge Quammen’s strengths as a judge and believe he should be retained in this position.